Motor Learning in Practice explores the fundamental processes of motor learning and skill acquisition in sport, and explains how a constraints-led approach can be used to design more effective learning environments for sports practice and performance. Drawing on ecological psychology, the book examines the interaction of personal, environmental and task-specific constraints in the development of motor skills, and then demonstrates how an understanding of those constraints can be applied in a wide range of specific sports and physical activities. The first section of the book contains two chapters that offer an overview of the key theoretical concepts that underpin the constraints-led approach. These chapters also examine the development of fundamental movement skills in children, and survey the most important instructional strategies that can be used to develop motor skills in sport. The second section of the book contains eighteen chapters that apply these principles to specific sports, including basketball, football, boxing, athletics field events and swimming. This is the first book to apply the theory of a constraints-led approach to training and learning techniques in sport. 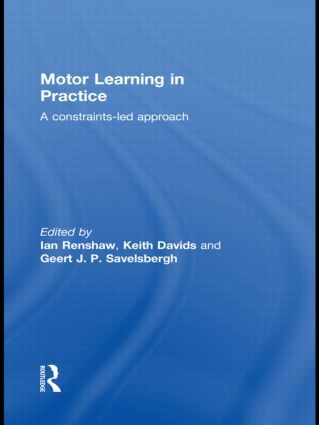 Including contributions from many of the world’s leading scholars in the field of motor learning and development, this book is essential reading for any advanced student, researcher or teacher with an interest in motor skills, sport psychology, sport pedagogy, coaching or physical education.